Great piece of literature easy reading and pictures that tell a story. Keep up the great work. An amazingly magnificent book I have read. I couldn’t put this book down. It well worth the read. Words are not enough to describe the wisdom and positivity of the journey of this classy lady. I highly recommend Rosalee Glass 100 years of wisdom. This inspirational book and takes you on an incredible emotional journey. Rosalee's words of wisdom make a lot of sense. This book is well written and the photos are great. This one of the best books I have read. I read your book. It was interesting and well written. For me the holocaust has been a series of old black and white news reels I didn't identify with. It happened before my time. Now I see color and victims with faces I know. It was a good book and I am glad you wrote it! The advice is good too. Much of what you said has already proven itself in my own life. So it works ! I will say if you are looking for cooking tips you’re in the wrong section of the bookstore! Looking for beauty advice? Go to the cosmetic counter! 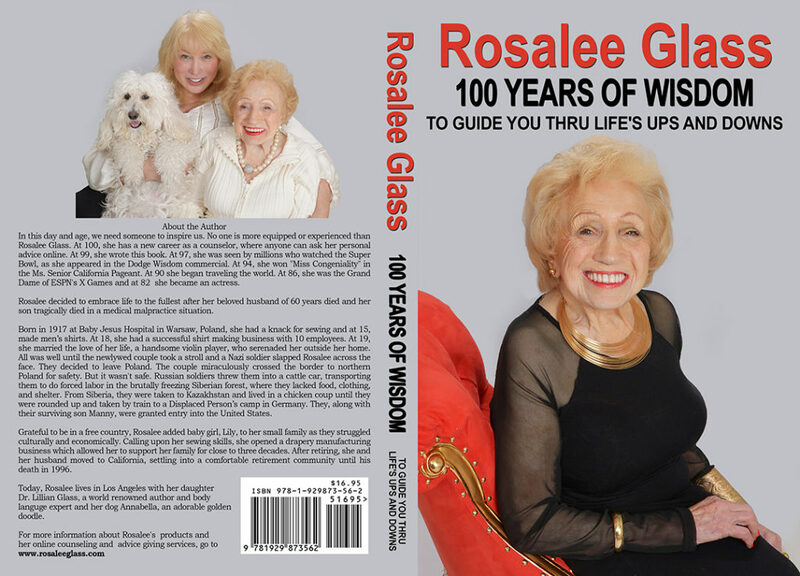 If however you are in search of the recipe for a richer life you will want “100 YEARS OF WISDOM” by Rosalee Glass. By richer I am not speaking about shopping on Rodeo Drive. This lady has traveled far and wide, much farther than a two mile stroll in Beverly Hills. Survivor. That’s what Rosalee Glass is. For one human being to share so much of her personal life journey with us is quite touching. Though she has walked through the valley of darkness more than once, clearly she is a lady who never lost herself to the world. Thank you Rosalee Glass for sharing so much of yourself with us through stories, photos, and words of wisdom! The words of wisdom by the way…some serious, some lighthearted & quite funny!